An industry leader in accessible luxury handbags, accessories, footwear and apparel, Rebecca Minkoff’s playful and subtly edgy designs can be spotted around the world on young women and celebrities alike. 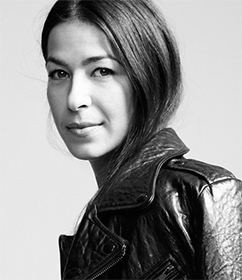 After developing an affinity for design while in the costume department in high school, Rebecca Minkoff moved to New York City at only 18 years old to pursue her dream of becoming a fashion designer. In 2001, Rebecca designed a version of the “I Love New York” t-shirt as part of a five-piece capsule collection, which appeared on The Tonight Show and became an overnight sensation. In 2005, Rebecca designed her first handbag, which she soon dubbed the “Morning After Bag,” a.k.a. the “M.A.B.” This iconic bag ignited Rebecca’s career as a handbag designer and inspired her “downtown romantic”-themed designs in the years to come. Rebecca’s success was further enhanced by the support of her brother and the company’s CEO and co-founder, Uri Minkoff, who helped usher in and pioneer the company’s industry-leading social media efforts. After four years of designing statement-making handbags and accessories with her trademark leathers, studs and edgy hardware, Rebecca returned to her roots of apparel design and introduced her first ready-to-wear collection in 2009. Today, Rebecca Minkoff has developed into a global lifestyle brand with a wide range of accessories, footwear, apparel, handbags and jewelry as well as men’s leather goods under the label Ben Minkoff. The brand is distributed in over 900 stores worldwide and five free-standing boutiques in San Francisco, New York, Los Angeles, Hong Kong and Seoul. In 2011, she won industry recognition when she was awarded the Breakthrough Designer Award from the Accessories Council. Rebecca is an active member of the CFDA and supports multiple philanthropies including Jessica Seinfeld’s non-profit, Baby Buggy. Rebecca is married to actor and director Gavin Bellour and they reside in New York City with their son, Luca, and daughter, Bowie.